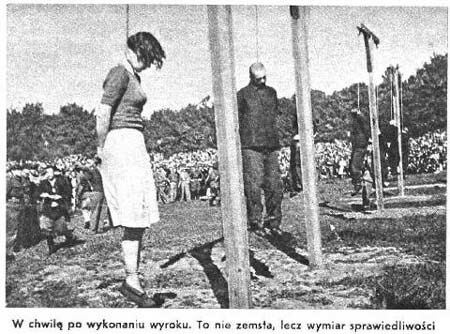 On this date in 1946, officials of Soviet-occupied Poland publicly hanged eleven convicted war criminals of the Stutthof concentration camp. Set up immediately upon Germany’s September 1, 1939 invasion of Poland and not liberated until after official German capitulation in 1945, Stutthoff handled over 100,000 prisoners during its long service. 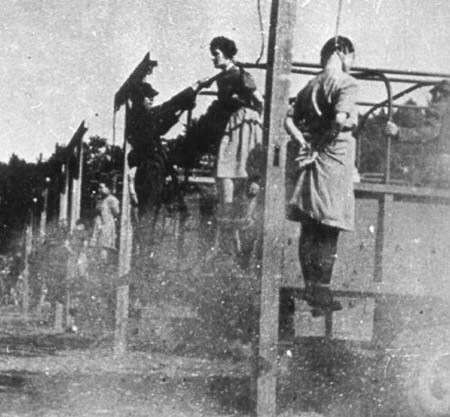 This day’s condemned — camp commandant Johann Pauls, five male kapos, and five female guards — were the product of the first of four Stutthof trials held in 1946-1947. At a hill in Gdansk known as Biskupia Gorka (Bishop Hill), upon a specially-erected row of four T-shaped double gallows centered around a pi-shaped triple gallows, and before a crowd of thousands, the doomed eleven were noosed on the back of military trucks which then drove away to leave them strangling to death with a “short drop” hanging. The following gut-twisting images are among a number to be found here. 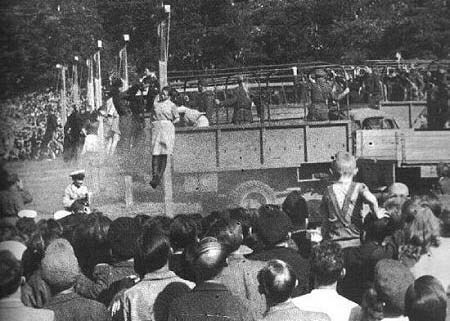 Above: on one end of the gallows row, the truck has just pulled away from Jenny Wanda Barkmann — a modish Hamburg lass in her mid-20’s known to Stutthof prisoners as “the Beautiful Specter” for her cruelty. Down the row, one can see that some of the prisoners are already swinging, while others have not yet been dropped. Upon hearing her sentence, Jenny Barkmann retorted, “Life is indeed a pleasure, and pleasures are usually short.” (More about Barkmann, including trial photos, here.) In this closer view of her, just as in the first photo, she is still alive and struggling. Next to her, Ewa Paradies, another guard, is prepared for the same fate. The central triple gallows. Commandant Johann Pauls hangs in the middle with Gerda Steinhoff — one of the senior female guards — in the foreground. The line of five male kapos recedes behind them into the enormous crowd of onlookers. There’s more about Stutthof’s history at the Holocaust Research Project, and at the current memorial facility’s home page.